The best peanut butter cookies are packed with peanut butter flavor. These soft old fashioned peanut butter cookies have been pleasing cookie lovers for generations. 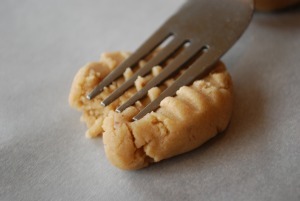 Sure to fill your cookie jar, this peanut butter cookies recipe makes six dozen cookies. If you don’t want to make all the cookies at once, the dough freezes well. Tightly wrap unused dough with plastic wrap and freeze for up to 3 months. If you don’t have shortening, or prefer not to use it, substitute the shortening with an additional 1/2 cup (1 stick) of butter or margarine. 1. Sift flour with baking powder and salt. Set aside. 2. In a large bowl, cream butter, shortening and sugars until light and fluffy. Add eggs, one at a time, beating well after each addition. Beat in peanut butter. Slowly mix in flour mixture, about one third at a time, until just blended. Cover and chill dough for 2 hours. 3. Preheat oven to 375 degrees F. Lightly grease cookie baking sheet(s) or line with parchment paper. 4. Remove dough from refrigerator and shape into 1-inch balls. Place balls 3 inches apart on baking sheets and flatten by pressing lightly with a floured fork in a criss-cross fashion. 5. Bake for 10 to 12 minutes until golden. Remove from oven and place cookies in a single layer on wire rack to cool.